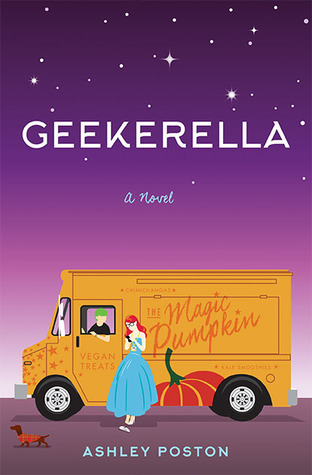 Part-romance, part-love letter to nerd culture and all totally adorbs, Geekerella is a fairy tale for anyone who believes in the magic of fandom. I LOVE Cinderella retellings (when they are done well) and I thought that Geekerella did a great job. Major nerd vibes which made me feel right at home. Elle and Darien both love the Starfield series. Reading about characters who are part of fandoms makes me as a fangirl and nerd super comfortable. I love reading books like this. Definitely one of my favorites. So many cheesy parts, such a cheesy story, but it’s also so great. Even though this story is a bit cheesy (but come on, it’s a Cinderella retelling so what do you expect?) But, Geekerella is written well, so even though it is a little cheesy at times it leaves you feeling light and happy. Definitely recommend if you want a quick, happy read. Sage is the friend that we all need. Elle has been basically a loner ever since her dad died. Her stepmom and step-sisters don’t make anything easier, but Elle really feels like she needs to do everything by herself. Once Elle has a job she meets Sage. Watching their friendship grow and develop was fantastic. Sage is there when Elle needs her, she’s honest, flawed, and real. Overall Geekerella was a fun read. (I actually read it in a day) but I definitely enjoyed this one! I gave it 4.5/5 stars. Do you like books about fandoms? If so which ones? Have you read Geekerella yet, what did you think? *Post contains affiliate links. This means I will receive a small commission if you make a purchase.